The most popular burger-serving game Stand O’Food extends to Tinseltown! The most popular burger-serving game gets a much-awaited sequel! Riding the wave of success in his hometown, Ronnie the Chef extends the operations of Stand O’Food chain to Tinseltown, where he meets Nikki and Mr. Clarence, and disrupts revenge plans of the evil Mr. Torg. Open restaurants around Tinseltown, and serve clients fast and healthy food in 25 restaurants under his management. 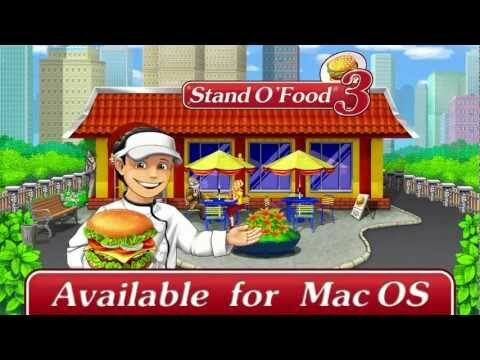 An exciting and fast-paced time management/puzzle game, Stand O’Food 3 will definitely entertain and challenge you! Add French fries, ice cream, coffee, and soda! Stand O’Food® 3 © 2011 - 2019 G5 Holdings Limited. Published by G5 Entertainment AB. Stand O'Food® 3, G5 Games and G5 Entertainment are registered trademarks of G5 Entertainment AB. Mac and the Mac logo are trademarks of Apple Inc. registered in the U.S. and other countries. All other trademarks and copyrights are the property of their respective owners.